Black Friday marks the beginning of Holiday shopping. 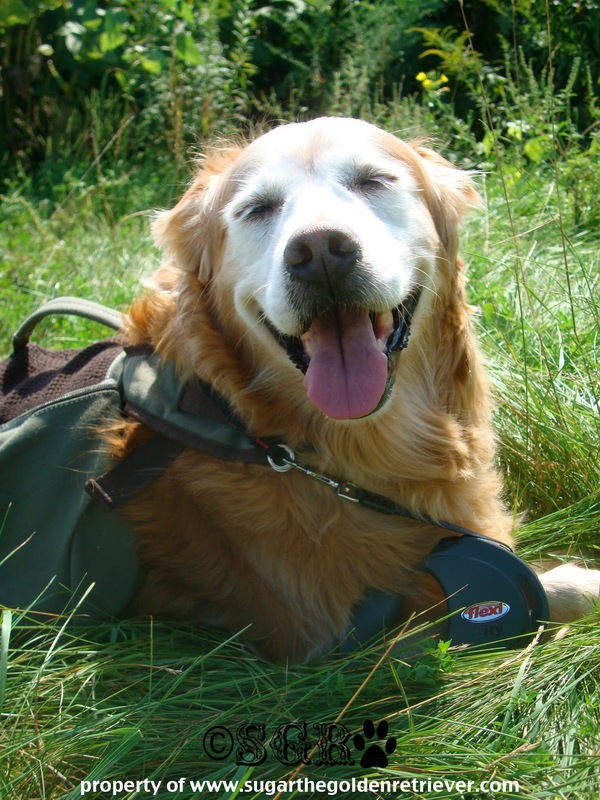 Here at Golden Woofs, Black Friday is the beginning of Holiday pet gifts giveaways. 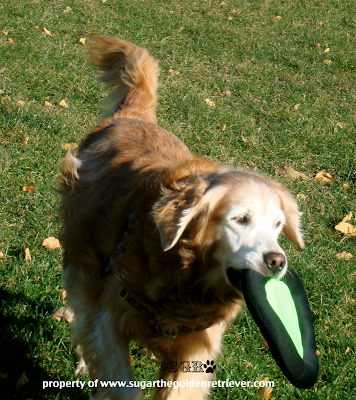 Loving Pets Bella dog bowl giveaway kicked off our pre-Black Friday giveaway. 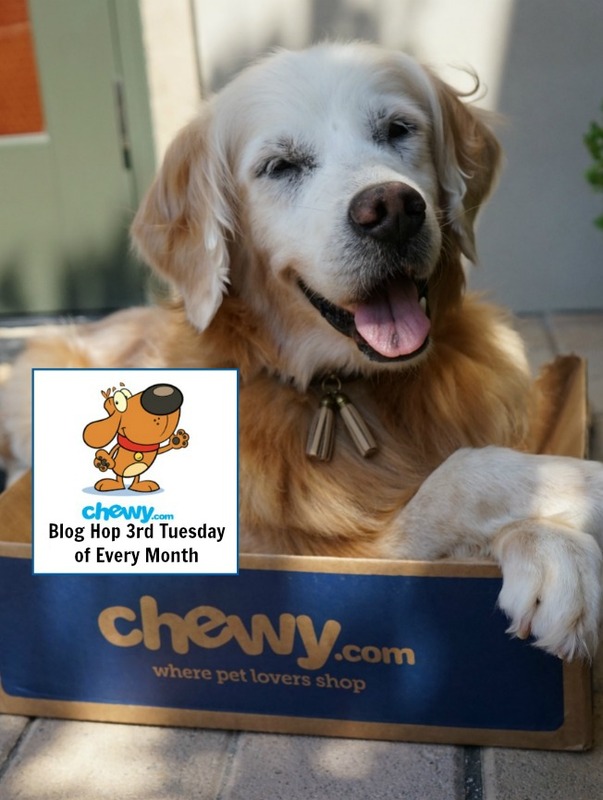 Join and enter the giveaway on our post, Must Have Loving Pets Bella Dog Bowl. 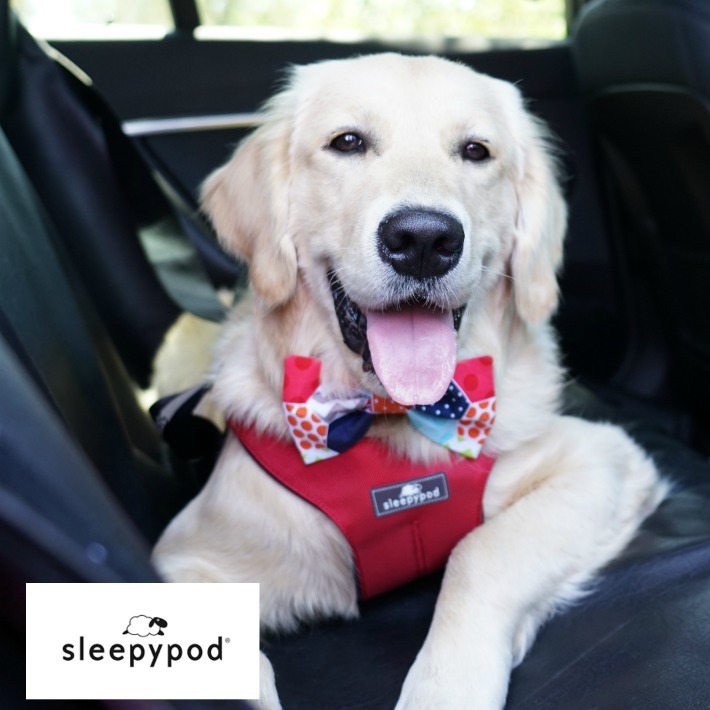 Our special Black Friday giveaways are provided by Flagology and Look Whos Happy. 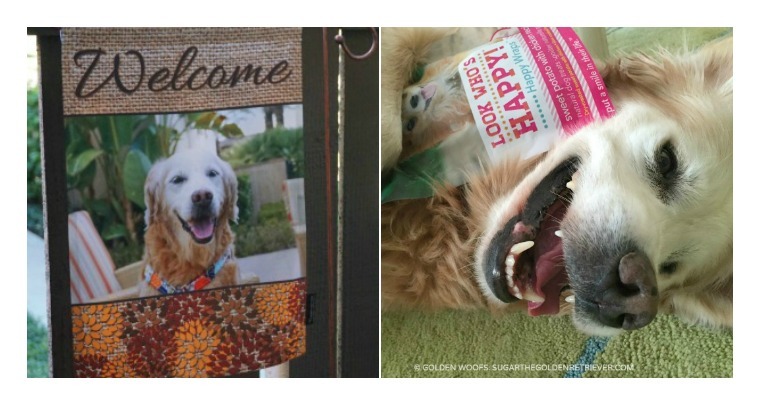 Flagology is an on-line flag store where you can create a custom garden flag of your dog. 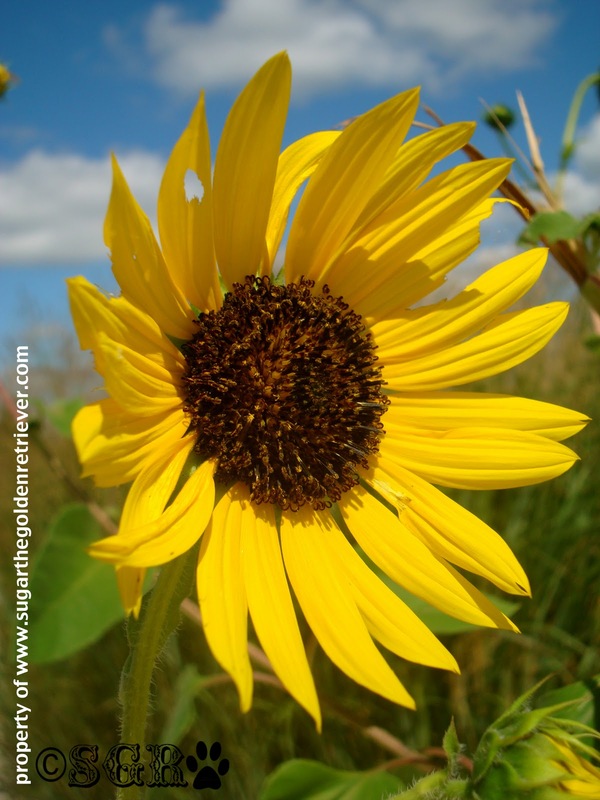 Golden Love Sugar’s flagology garden flag. 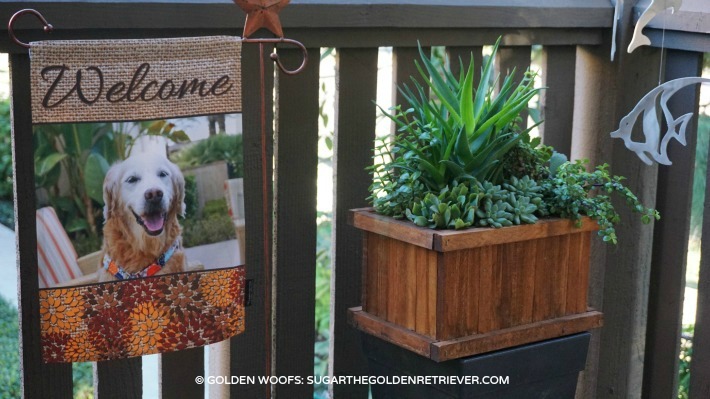 Read our post, Make A Custom Garden Flag Of Your Pet for more information about Flagology. 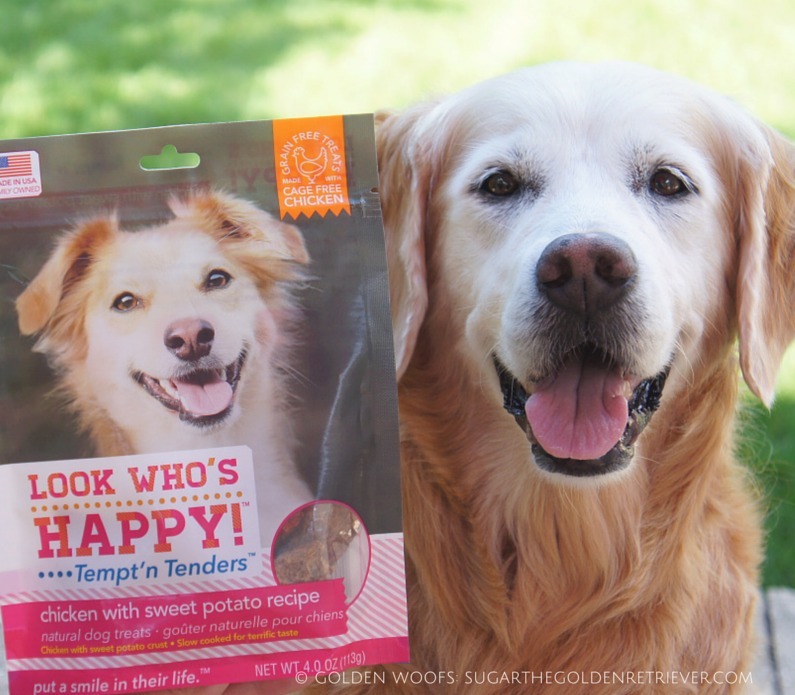 Look Who’s Happy are natural dog treats and crafted from healthy ingredients. 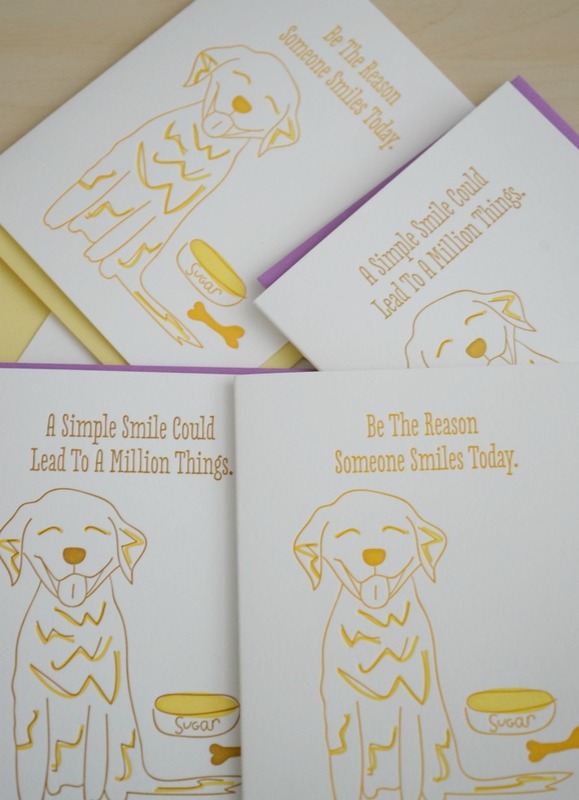 These treats will definitely put a smile on your dog’s face. 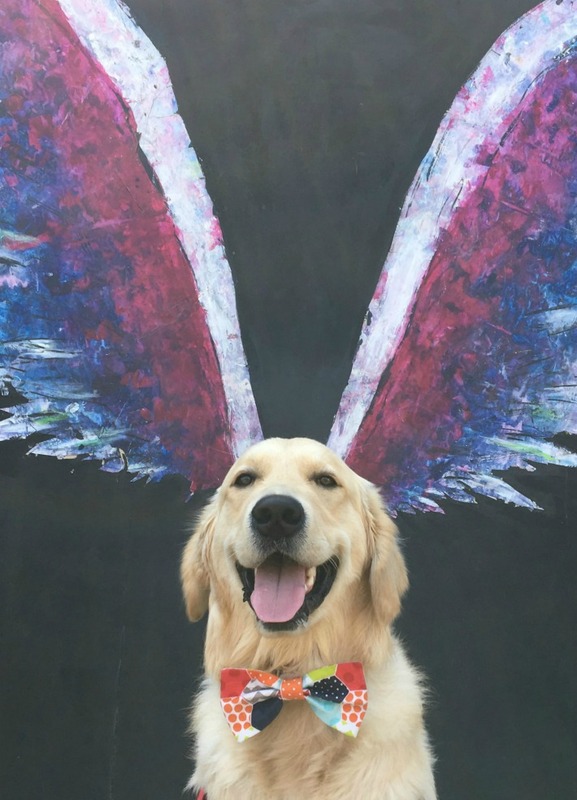 What Holiday present(s) do you plan to give to your pet? Many refer to Black Friday as the kickoff to holiday shopping. 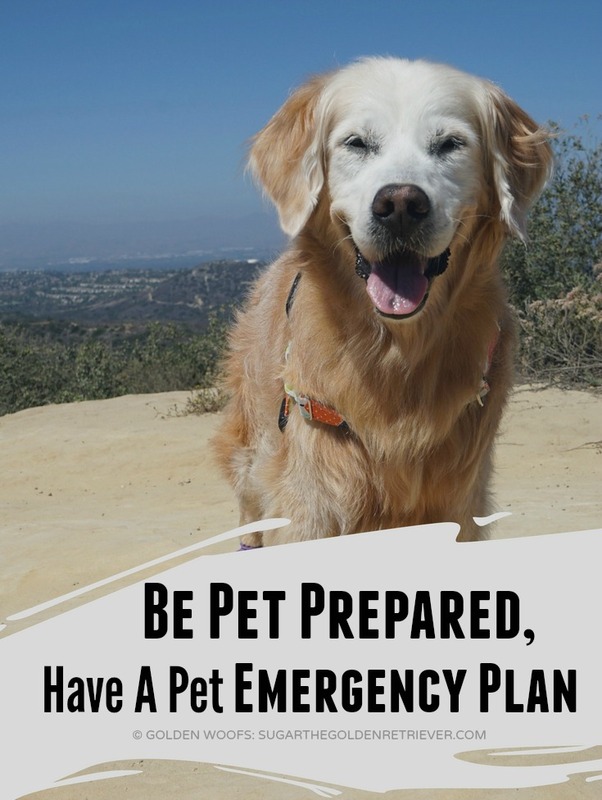 Don’t forget your furry friend! 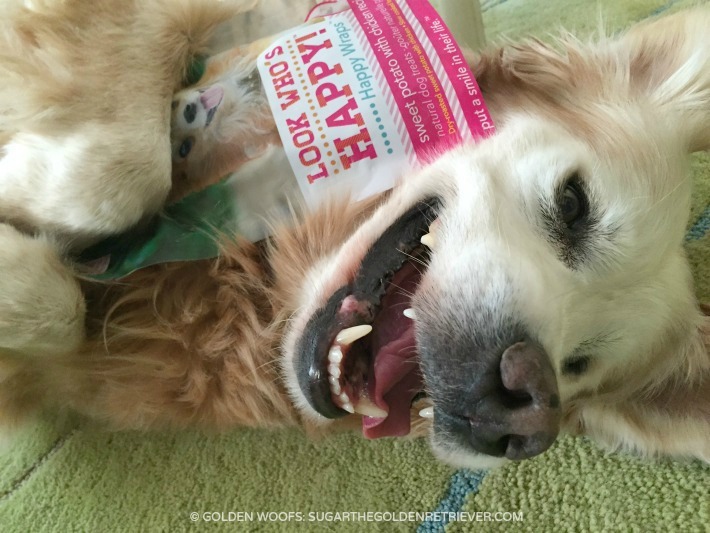 Put a SMILE on your Dog with Look Who’s Happy tasty dog treats. Nourish your dog with Caru Natural Stews. 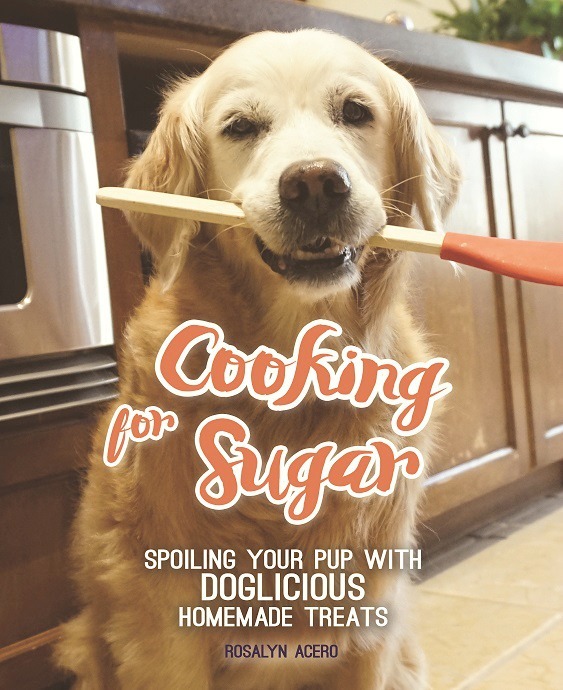 Your dog will love its homemade taste. 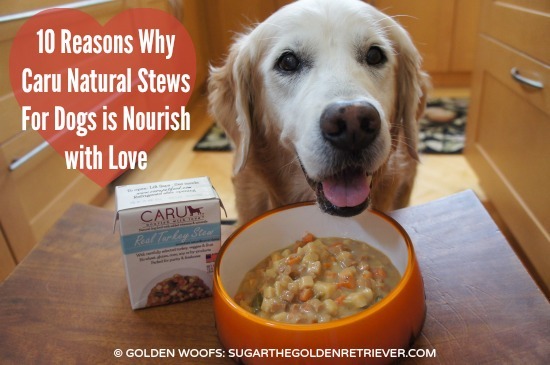 If you missed our review of Caru, we invite you to read 10 Reasons Why Caru Natural Stews For Dogs is Nourish with Love. Follow the giveaway tools. We are drawing 5 winners for each giveaway. The big luggage is out. Where are we going? Where’s my luggage? 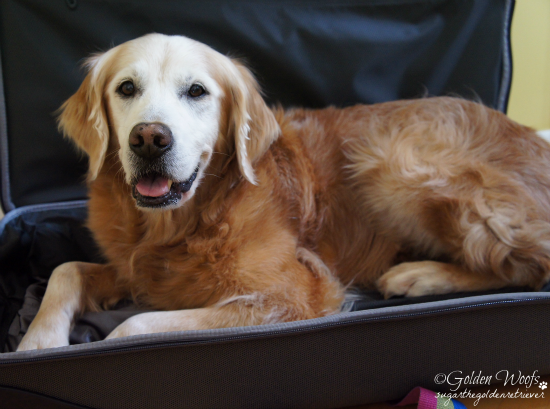 Mom is packing for 5th BlogPaws Conference, a social media conference for pet enthusiasts. 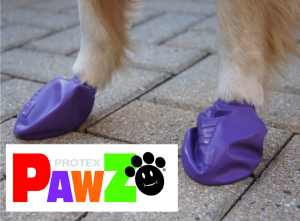 Why is she attending Blog Paws conference? 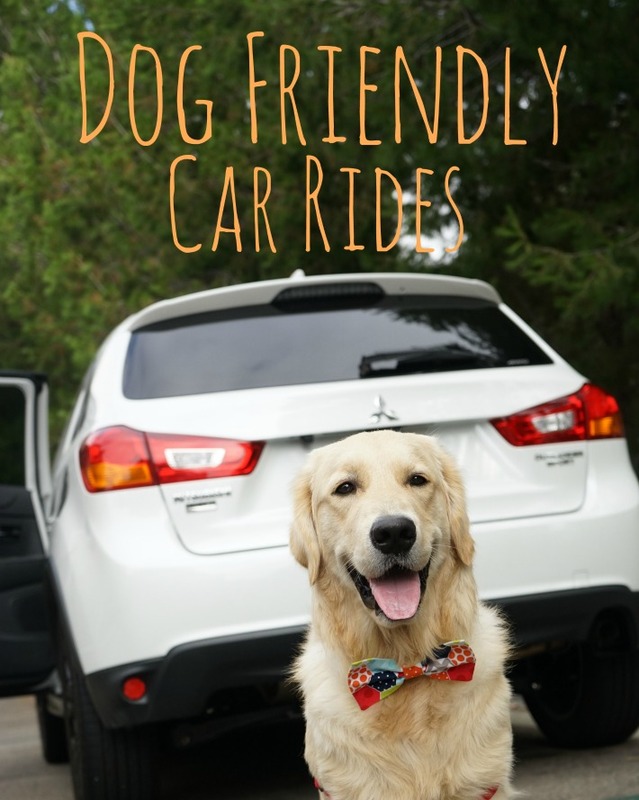 One reason is to network and connect with other bloggie friends and other pet enthusiast. 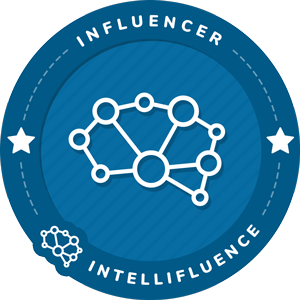 Another reason is to learn more about blogging, social media and other resources to assist mom to bring our blog to the next level. 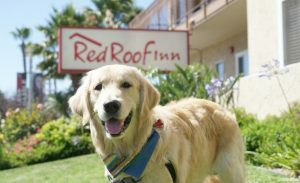 Whatever that means….. For the past years, BlogPaws got lots of buzz as a MUST conference to attend by pet enthusiasts. Mom is excited as a 1st timer attendee and at the same time nervous. 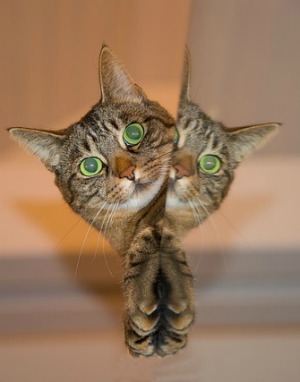 So what has she done to prepare … 3 Things Mom Has Done To Prepare For Blogpaws. 1) Packed some casual attires which means jeans and shirts. Mom finally printed the design she created to commemorate my adventure life in HI. 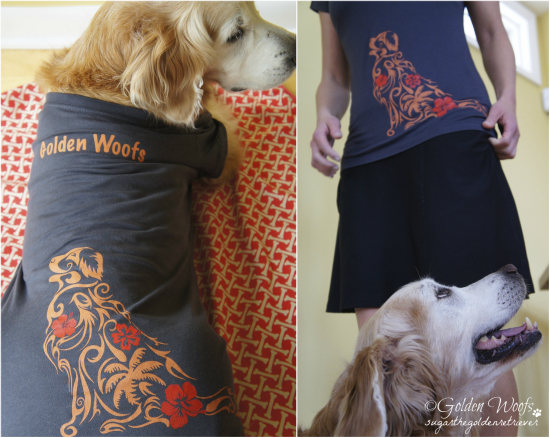 Of course, the front of the shirt will have our blog name, Golden Woofs, Sugar The Golden Retriever. 2) She packed some business cards of our blog and our online shop. Our blog business card is double sided. On the back side, mom used our FB timeline cover photo and also a list our social media information. 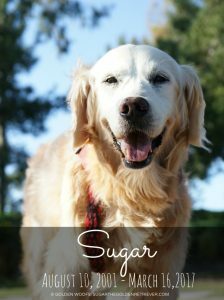 Mom is also bringing hard copies of her book, Sugar’s Furry Friend which is now available in Amazon. Oooops! 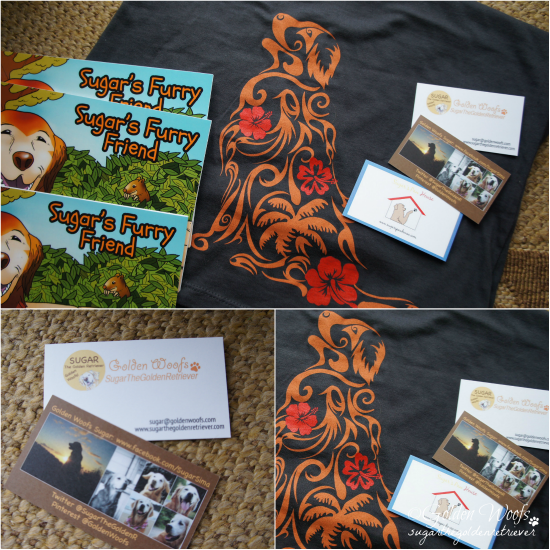 The giveaway is 2 Golden Woofs: Sugar’s HI T-shirts. It comes in two styles, fitted and regular(loose), in 3 sizes S, M, L and in Black, Gray or Brown. To join the giveaway just indicate on your comment below. The shirt is for human … just helping mom model it. Soon, this shirt will be available for sale in our on-line shop, Sugar’s Paw House. Make sure to check back on Monday as we got another giveaway. Also, I invite you to check our Tasty Tuesday post. Mom made a special treat that had me SMILE and for sure you will too once you see/read our post. 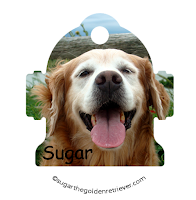 The tag can be used as a regular pet tag or as an accessory for your key chain or bag or luggage. Oh use a red string and it can be a great holiday ornament. task #1 You MUST be a SUBSCRIBER of my BLOG. So if you are not a subscriber, on my side bar box under Follow my Blog, enter your email address. You must confirm your email address in order to qualify for the giveaway. #2 Leave a comment that you want to participate on the giveaway. #1 and #2 tasks are Mandatory. as always LOVE to hear from you. 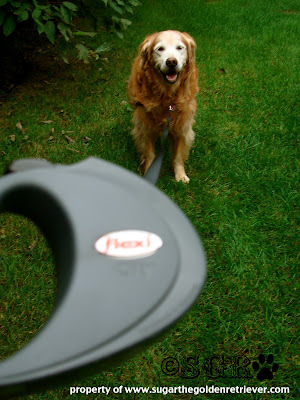 Golden Surprise when we received an email invitation to try out the new 6ft retractable leash from Flexi. WHY? we never used a retractable leash. Yes, you read it right … never had a retractable leash. Since mom got me (10 years ago), I only had 2 leather leashes 12 ft 1 inch wide and 6ft 2 inches wide. It was suggested and recommended by my trainers. Both of my leashes are still in great condition. We often use the 6ft 2inches wide. I’m proud to say that I am well trained when we go for a walk/run. I heel at all times. So using a retractable leash was something new to my mom and I. She read the instruction on the box and on Flexi website. She also watched a short video how to operate the Flexi leash. Here I am in the backyard trying out the retractable leash. Unfortunately, the safety collar did not fit my neck so mom just attached the Flexi hook directly on the d ring of my harness. Mom and I walked around the backyard testing how to operate the leash, specifically the stop, brake and release controls. What we like is the 6ft length … just enough length. 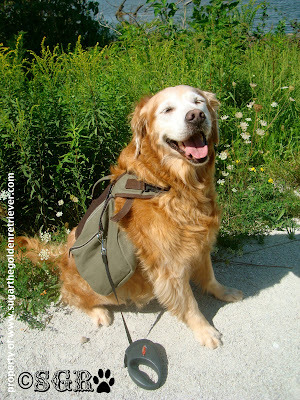 We are ready to test Flexi leash on our walk in the park. Here I am at my favorite park. We went for a mini hiking adventure. and was able to attached the Flexi leash hook. At first, my mom was uneasy using the Flexi leash but after getting use it she got comfortable. She had to stop and say the word “go” to me so I can walk in front of her. Cool! I was able to sniff lots of stuff on the ground … that was FUN. Mom saw a small animal (a frog Ribbit!!! 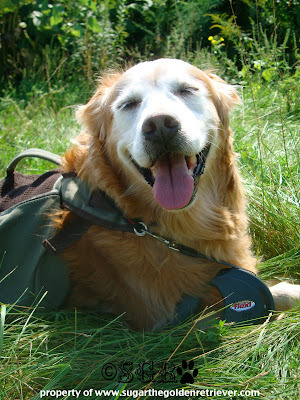 ), she immediately called me and the retractable leash did an awesome job as I walked towards my mom. Also, on our walk many walkers/hikers use the same leash but they were not being responsible dog owners. I think the thin cord of the leash makes some dogs feel as though they aren’t actually on a leash, and as a result, the dogs go everywhere and do whatever. From this we believe that a retractable leash is not for everyone. at the same time feels as if I am close to my mom. My mom felt that the handle/grip is a bit big since she has petite hands. She wishes the handle and the width of the leash come in different sizes. A width of 1 1/2 to 2 inches will be great. All in all, I give this 6ft Flexi Leash 3 Golden Paws out of 4. 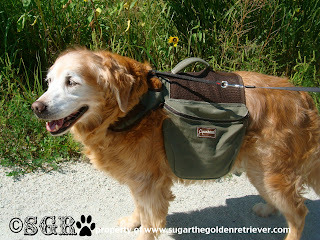 It is a leash we will be using on our mini hikes and short relaxed walks. I had a Golden Delightful mini hiking adventure. Lots of Golden Thanks Flexi. Do you want to try Flexi Leash? We are using a new system, Rafflecopter to manage all the entries. If you are participating, the First 3 Tasks is a MUST (mandatory). You MUST be a follower of my blog, visit Flexi website and leave a comment after this post. Make sure you click on “I DID THIS” on the Rafflecopter box and provide your name/email. All other entries on the box are just an additional entry/chance to win. Giveaway ends on Saturday, Sept. 24 at 12:01am. We (SGR) are not compensated on this product review and giveaway. 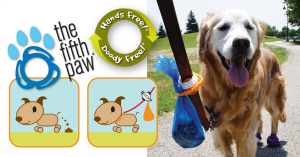 would love to know if you use a retractable leash. We saw many SUNFLOWERS on our mini hike … want to share a photo.